“We shortlisted two companies for the project. 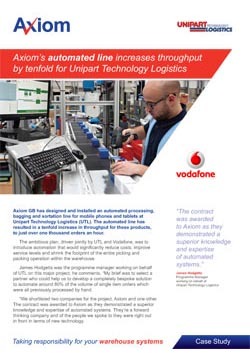 The contract was awarded to Axiom as they demonstrated a superior knowledge and expertise of automated systems. They’re a forward thinking company and of the people we spoke to they were right out in front in terms of new technology. “Investing in automation has given Unipart Technology Logistics a number of major benefits. Their client’s service has improved – Vodafone customers can now place an order as late as 7pm for a next day delivery.